Destiny’s final content update, Age of Triumph, aims to supply Destiny players with a plentiful serving of activities to partake in, including every Raid brought up to the current light level. During a livestream which aired today, Bungie showed off some of the weapons and armor that will serve as reward for players interested in revisiting Vault of Glass, Crota’s End, and all of the Raids since the game’s launch. The armor rewards for each raid have been redesigned to reflect their featured enemy types with new dynamic effects. 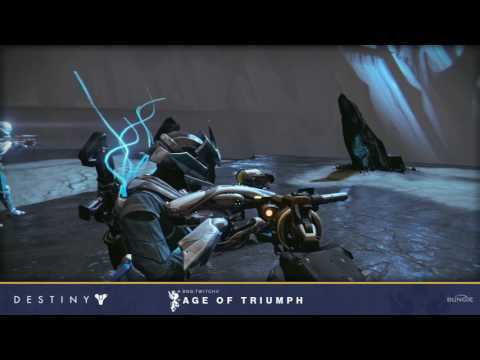 From the Vault of Glass, armor sets will assume a Vex-like appearance, including a Warlock chest piece decorated with tentacles from a Harpy. The new Wrath of the Machine armor sets appear to be very similar to the original Raid gear, but with an added light-effect radiating from the helmets and shoulders. Armor rewards from Crota’s End and King’s Fall also feature some flashy lighting effects, but these also function as responsive damage indicators, dimming and restoring as your guardian’s shields become depleted or recharged. As Bungie had announced in a previous stream, every Raid-specific gun will be returning with Age of Triumph, and it turns out some of them will come as both Legendary and Exotic. While guns like Fatebringer and SUROS Regime were originally Legendary and Exotic weapons (respectively), both of these guns, and several other Destiny weapons of yore, will be returning as two available weapons; one Legendary and the other Exotic. The Exotic variants are referred to as “Adept” versions and will be assigned an elemental damage type (arc, solar, or void), while the Legendary versions of the same weapons will allow players to enjoy the perks of their favorite old guns without filling their Exotic slot. Thankfully, all of these weapons will drop at max light level. Destiny: Age of Triumph is set to launch on March 28. This update is expected to be the final one before the imminent release of the still unannounced Destiny 2. Though technically unconfirmed, we’ve heard plenty about Activision’s plans for the sequel, including that it will be out this year. More recently, an image leaked of a promotional Destiny 2 poster that puts the game’s release date in September.